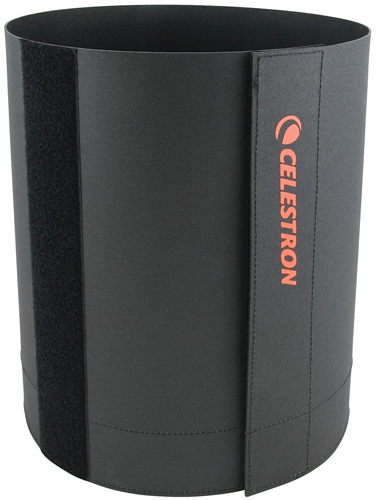 is designed for Celestron C6 and C8 SCT telescope. This Lens Shade tube is of approximately the same diameter as your telescope tube which reduces the amount of dew that builds up on the corrector plate. This Shield features a dual velcro strip so that users can adjust the shade to a size that fits either a C6 or C8 telescope. It also serves as a lens shade, preventing stray light from falling upon the corrector plate and greatly improving contrast. This lens shade is build up of rugged, soft foamex plastic. It can be stowed away flat after usage. It employs a thicker material that won't crack as easily, with sewing instead of inexpensive glue for a longer service life. We are working together with eBay to ensure your protection. Please allow us the opportunity to resolve any issues before opening disputes and/or leaving feedback. Feel free to contact us. We are open Monday-Friday 9:00AM-5:00PM EST. We are closed weekends and holidays. - We Only ship to a confirmed PayPal addresses. No exceptions. - A 8.875% sales tax charge is applied for items shipped to NY state. Alaska, Hawaii, US Protectorates (Puerto Rico), APO/FPO, PO Box addresses. The item comes with U.S. voltage of 110 Volts. So Please ensure that this product is compatible with the standards within your country before purchasing. You are responsible for shipping and handling charges in the event of a returned package. You are responsible for any import duties. We will not reimburse any shipping or duty charges for any reason. This includes all returns. Please contact eBay if you wish to receive a shipping or Duties credit.